You don’t want to stay stuck in a 9-5 job. You want to add more freedom to your lifestyle. If you plan to run your own business, you have come to the right place. The BBQ Cleaner is happy to present to you a business opportunity in Connecticut. It starts up so quickly that it should have an ignite button! This is a type of cleaning business that does not require a huge start up cost and you will not meet a lot of competition. It is about time you turn your entrepreneurial dreams into reality. You will be able to work via a flexible schedule and do not need to pay the usual franchisee fees. Yes, you keep what you earn! At The BBQ Cleaner, you do not need to pay us any yearly or monthly royalties. Is this your first time starting a business? Do you doubt yourself because you have zero experience in running a cleaning business? Do not fret for The BBQ Cleaner team provides lifetime support, from day one when you register and start operating your business. Apart from providing operational guidance, we supply your marketing materials as well! As you can see, we have got you well covered. Why Start a BBQ Cleaning Business in Connecticut? Pleasant Weather Conditions for Conducting Business: The summers are warm and not too hot. It is one of the best times throughout the year where families tend to be outside barbequing. This indicates that there will many individuals needing grill cleaning services. Can Look Forward to Repeat Business: You can expect to build a strong customer base where customers keep coming back every year. Expect Little Competition: You are providing a unique service in Connecticut because hardly anyone wants to clean greasy and dirty BBQ grills. Limitless Scalability: As more people get to know about your grill cleaning services, you can easily grow your company by hiring more passionate staff members and vehicles. How Does The BBQ Cleaner Help You Get Started in Connecticut? When you start a business with The BBQ Cleaner, you automatically have access to on-going lifetime business support and an all-in-one starter’s package. Our goal is to ensure you can grow your business successfully. We were incepted in 2009 and we have more than 180 operators throughout the United States to date. You can be sure that we are a global leader in the BBQ and grill cleaning industry, and we have the experience and expertise to help you unlock limitless earning potential when it comes to grill cleaning services. 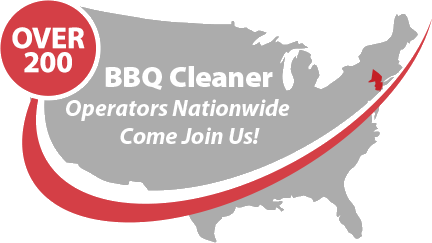 Talk to us today to find out more about this stellar BBQ cleaning business opportunity in Connecticut!